My last Christmas card for 2011 is also my entry in Paper Cutz Challenge #119 "All Hearts Come Home for Christmas! ", and the "Something Old... Something New" challenge at Simon Says Stamp and Show. I love the vintage look of your card, cute paper for the sentiment! Oh, my goodness, this is beautiful! The rich colors are just gorgeous! How cute is that! 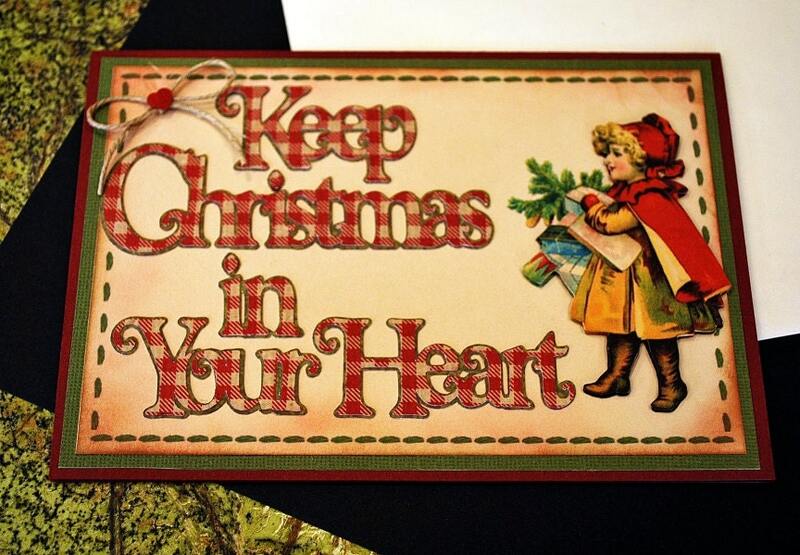 I promise to Keep Christmas in My Heart. Sweet, sweet card! Hi Cindy, you're a winner of a new quilling book via the giveaway on AllThingsPaper.net! Please send me an email at ann.b.martin (at) gmail.com and I'll see that you receive your copy. Cute card btw! Hello Cindy! Your card is beautiful. I too love the vintage look. Also thanks for playing along on my blog to win the candy! Hey I just became a follower of yours!